Kinetic aspects of the reaction of 2-hydroxyethyl-1,3,4-trimethylcyclohex-3-ene-1-carboxylate obtaining have been investigated. On the basis of the obtained results the kinetics of the process has been studied by the Michaelis-Menten equation. The limiting stage of the reaction is established and its mechanism is suggested. 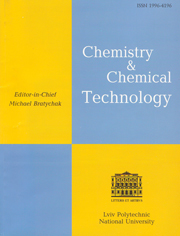 Voet D. and Voet J.: Biochemistry 4th edn., Wiley, NY 2011. Polyova I., Marshalok G., Fedevych M. et al. : UA Pat. 46772, MPK С 07 С 11/00. Publ. Jan. 11, 2010. Polyova I., Marshalok G., Fedevych M. et al. : UA Patent 52884, MPK С 07 С 11/00. Publ. Sept. 10, 2010. Polyova І., Polyuzhin I., Marshalok G. and Gladii A.: III Vseukr. Nauk. Konf. Stud. i Asp. “Khimichny Karazinski Chitaniya 2011,” Kharkov 2011, 41. Shmid R. and Sapunov V.: Neformal’naya Kinetika. Mir, Moskwa 1985. Jasinski R., Kwiatnowska M. and Baranski A.: Wiadom. Chemiczne, 2007, 61, 485-514. Woodward R. and KatzT. : Tetrahedron, 1959, 5, 70-89. Ross S. and Kuntz J.: J. Am. Chem. Soc., 1954, 76, 3000-3012. Hammett L.: Physical Organic Chemistry. McGraw-Hill, New York 1970. Marshalok G., Oglashennyi Yu., Makitra R. and Yatchishin I.: Zh. Org. Khim., 2003, 39, 1221-1226. Makitra R., Tsikanchuk Ya. and Turkevich O.: Dokl. Akad. Nauk SSSR, 1976, 5, 435-437.